After four days in London, it was suddenly time to switch gears – time to get into an academic frame of mind, time to spend more time reading lengthy articles than sorting through hundreds of pictures, and time to venture out of my comfort zone and network as much as possible, rather than being perfectly content wandering through a city where not a single person knew my name. I tucked my London ticket into the zippered pocket of my backpack and pulled out the ticket I needed next. 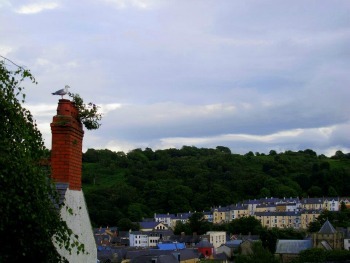 I was off to Bangor, Wales – a place I knew nothing about, except that it was a University town, and that some amazing bilingualism and neurolinguistic research is going on over there. What are the kinds of questions that research on bilingualism tries to answer? How does language develop in children who grow up bilingually? How does a child learn two grammar systems and two sets of vocabulary at the same time? What kinds of environmental factors have an important impact on learning multiple languages (e.g., the age at which you start, the amount of exposure you have to each language, or how implicit/explicit language instruction is?). Is it true that if a child has disordered language, parents should drop the idea of bilingualism and focus solely on one language? What kinds of bilingual education programs are most efficient? Neurolinguistics, on the other hand, deals with how language is stored, understood and used by the brain. In the case of bilinguals: How does the brain cope with more than one language? Are the grammars and vocabulary words of each language kept separate, or are they stored together in the mind? How do a bilingual’s different grammars and vocabularies influence each other? How does a bilingual speaker manage to switch languages so effortlessly? How does memory capacity affect how the brain learns and uses new languages? How does being bilingual “protect” the brain and slow down the onset of Alzheimer’s disease? Is it true that there is a limited developmental period for language learning early on in life, after which a child’s brain is fixed to his/her first language, and being like a true native-speaker in a second language is impossible? Similarly, if an individual learns a second language in adulthood, will their brain process this language the same way as a native-speaker’s brain does, or do they use very different strategies and different brain areas? Researchers in neurolinguistics either study language in healthy individuals, or in individuals with disordered language (e.g., in the case of aphasia after stroke or head-trauma). Some researchers have also been looking into how language abilities might change in aging or after adoption or immigration to a new country where a new language must be learned and used on a regular basis. As you may have noticed, these questions touch on a range of issues, across a range of disciplines (e.g., linguistics, psychology, education, neuroscience, etc.). Bilingualism and neurolinguistics researchers come from a variety of academic backgrounds, and so this research is fascinatingly multi-faceted, with many important implications for clinical settings, educational settings, as well as for every-day life. 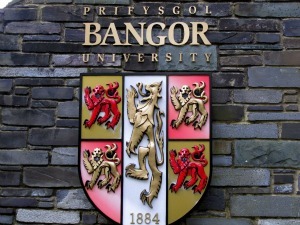 Given how much state-of-the-art bilingualism research is being conducted in Bangor, and given Wales’ bicultural and bilingual history and environment as well, it seemed indeed like the perfect place for a two-week Summer School on Bilingualism to be offered to PhDs and post-docs from around the world. And, given that this is precisely my field of research (more on that in another post! ), I was one of the twenty or so students who flocked to the tiny town to fill my brain with knowledge, new ideas, and – as I would soon discover – many new, unanswered questions! 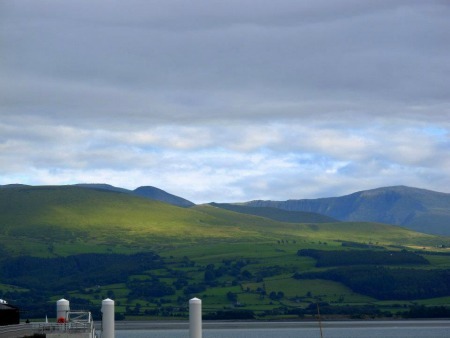 Although Wales is immediately adjacent to Britain (and Bangor is only an hour and a half from Manchester), my first glimpses of the region made me feel plunged into a different world. For one, there was the coastline – a gorgeous body of pale blue water stretching far into forever, until it met the sky. Rocky coves, jagged cliffs, rolling hills, steeples and castles now and then perched upon a cape, occasional wind turbines and wooden piers – these were my first impressions of Wales as the car zipped along the North Wales Expressway. I also remember immediately noticing that the hills were of the brightest green hue I had ever seen in nature – as though one had disproportionately boosted their color saturation. Aside from the impressive coastline, the other image that lingers in my memory and that appears at the first mention of Bangor is this fresh hue of green. The driver was a young guy, possibly only a few years older than me. I had initially hoped the ride would allow me to rest quietly after the travel-induced grog that had settled over me. But he was so friendly and so welcoming that I felt myself wake up in the few minutes it took to walk from the airport to his car, and we talked the whole way to Bangor. He talked about having grown up in the area, described the layout of the town (comprised of an Upper Town with the University and student life, and a Lower Town with shops and the train station). 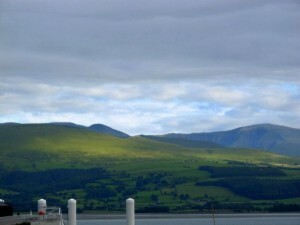 He gave nice recommendations of places to explore, including the Snowdonia National Park nearby. Snowdon – the tallest mountain in Wales – could easily be climbed, he told me. My face must have unconsciously let on that I am not much of a hiker because he added with a smile that there was also a mountain railway I could take up and down. 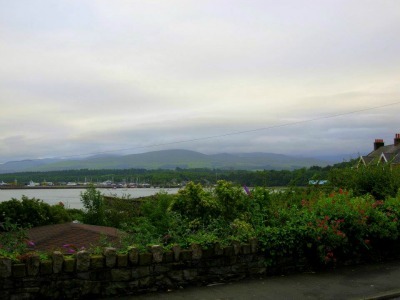 He asked about me, my research, and my travels, our conversation continuously perforated by my asking him to repeat himself (my ears unaccustomed to the Welsh accent) and by his pointing to draw my attention to a nearby castle, a church or a town name. (All names, by the way, seemed to start with C or L, or an L that sounded like a C, and to contain at least 2 W’s or 2 F’s. I tried to keep them in memory until, much to my dismay, I found out later on that their written form bore very little resemblance to their sound). I got settled into my room on campus, amused that I was experiencing the dorm-life I had not even experienced during my Master’s abroad, because I had always preferred to rent apartments in the city. I set up my desk with work-related objects I hadn’t unpacked in London. I set my trusty rain-boots close to the door (no doubt my greatest investment this year, and possibly even in the last 3 years). I then set out to explore Bangor and felt immediately turned around. It is curious that I faired so well in huge London and then got lost in the place that everyone had referred to as “a really small town”. 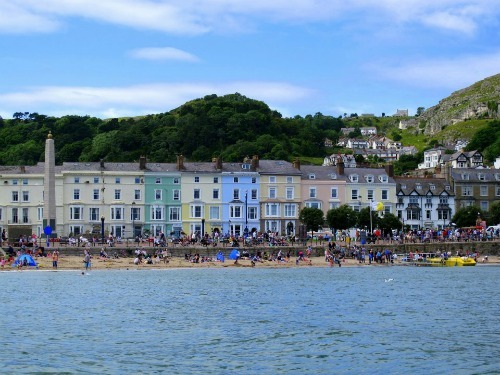 I noticed the bilingual signs, the seagulls laughing, how inexpensive everything was at the local grocery store, and how many Welsh cheeses I absolutely had to try in the two weeks that I’d be staying there. The air was incredibly crisp and fresh, as though you could feel your lungs rejoicing as you breathed in. 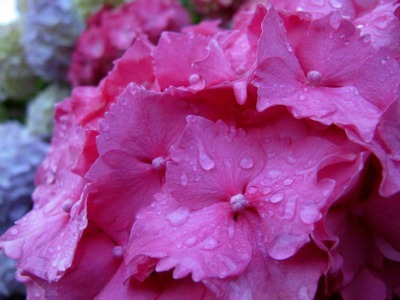 There were beautiful flowers everywhere, with tiny raindrops sitting on their petals, waiting for a stronger sun to chase them away. The Summer School began the next morning. Five different courses were offered each week, and I had signed up for most of them. 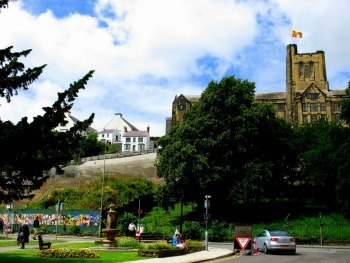 Many distinguished lecturers had been invited from around the world to offer lectures in their area of expertise, while others were Faculty members at Bangor University. The courses had to do with many of the questions I highlighted above. They served to educate us on historical and often controversial debates in the field, summarize recent research on these topics, and discuss different methodologies to use (e.g., eye-tracking methods during reading, brain imaging methods while a subject processes the grammar or vocabulary of a language, etc). Some of the lecturers spent time presenting their own research, which was very interesting because it felt like an extended talk at a conference, but where you would be able to ask them as many questions as you wanted. In addition to these courses, the Summer School organizers had invited other researchers to give keynote lectures in the evenings, and there were a number of social events where you could mingle and get to know other graduate students from every nook and cranny of the world. There were also two poster sessions where the participating PhD students presented their own work on a range of different topics to do with bilingualism. Needless to say, the schedule – if you were participating in nearly everything – was packed! But it was a tremendously stimulating forum for students and researchers at any stage, and a perfect networking opportunity. One of my main goals when I signed up for this Summer School was to get detailed feedback on my experimental design from at least two researchers who would be there – one visiting lecturer, and one researcher in Bangor whose research interests overlap with mine (and my supervisor’s). I mustered up some courage to approach them and introduce myself (bear in mind that these are big names in the field, and very busy people who may or may not have time to meet with a PhD student they don’t know!). Just as most of life’s most rewarding experiences often involve stepping outside of one’s comfort zone, it was extremely beneficial for me to request these extra meetings. In the case of the local lecturer, I even was given a tour of his lab and was introduced to his PhD and post-doc students. The feedback I got was very useful; it sparked lots of questions and new thoughts, and led to discussions I had with my supervisor upon my return. Academically-speaking, the two weeks in Bangor were fruitful and mind-opening. The courses introduced me to new literature and to many new ideas and theories I had not considered in depth before. One of the most blatant signs of how much I was learning was that I suddenly found myself thinking in different ways about the very same things I have been studying for years! Like an unravelling ball of yarn or a rewinding tape, I felt like I was suddenly unknowing what I knew! Was this doubt and confusion actually learning? I worried for a little while. I took tons of notes and would read them on the train on weekends, marking the pages that triggered a thought (whether an enlightened thought or a confused one) or a question. I knew I would need some time to organize all the information and consolidate it, but at least I had been exposed to these issues and I knew where to find the information, if I needed to think about it in depth again soon. The two weeks were also utterly exhausting! The back-to-back classes with a tiny lunch break, the intensive manner in which the topics were covered over just one week, the information overload, the networking and extra meetings, and days of cold, damp rain – it made me need sleep, badly! Despite this need to rest, though, my nights would be interrupted by loud seagulls congregating outside the residence, fervently discussing whatever it is they felt the need to discuss at 4.30 in the morning. I would wake up, glare at the white birds, and make myself a cup of hot tea … and with that cup of tea my urge to sleep dissolved until midway through the next day! 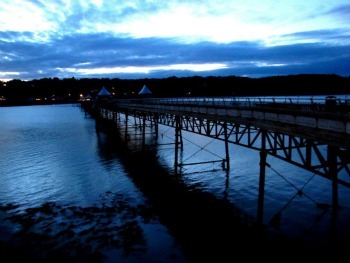 Because travel and inspiring experiences are equally important to me as my work is, I tried to make as much time as possible to explore Bangor and its surroundings. 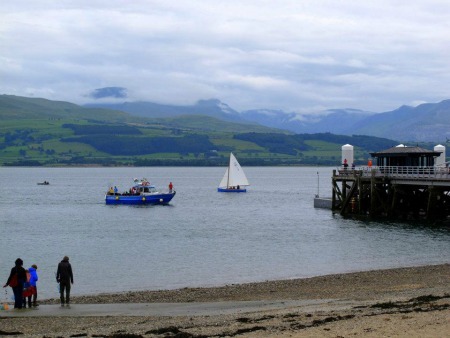 When I didn’t have class, I set off on a bus or train to explore the lovely and peaceful seaside towns of Beaumaris and Llandudno. 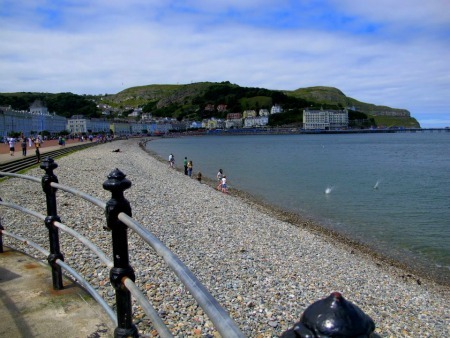 I fell very much in love with Llandudno and prolonged my time there hour by hour, walking along its elegant promenade, and pausing at benches that had been engraved with names and memories of people. For Anna, who loved Llandudno. In memory of Sam, who loved to sit here in the summer. 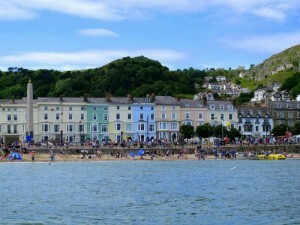 I stayed until there was only one last train to catch, until I had soaked up all Llandudno’s colors, smells, sounds and until the shops and food venders on the famous pier were closed for the day. I loved the train ride along the coast and wished I had more time to take the ferry over to Dublin, so that I could say that I’ve been in Ireland, too. 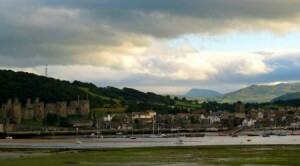 The way the train passed directly alongside the impressive Castle in Conwy was one of the highlights of the coastline for me. Bangor also had a wonderful pier, with a cozy place for tea and scones at the end of it. 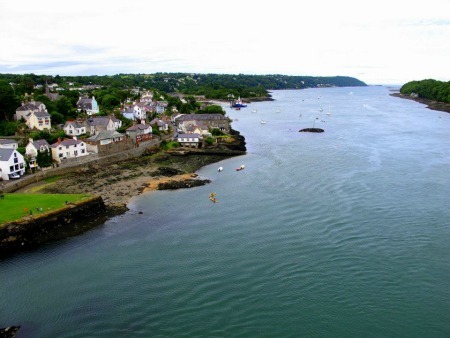 There was also a great chain bridge over the Menai Straight – for the first time ever, I felt overwhelmed with vertigo when I stood on it, in the wind, watching tiny kayaks and water ripples below. Bangor became infinitely more beautiful in the sun (or, rather, you were able to notice its beauty more readily when you were not constantly at eye-level with the rim of your umbrella). I went to the southern limit of the country and spent a weekend in Cardiff, which I adored. I had lots of fish and chips, fresh seafood, and bangers and mash, lots of Welsh cheese (insert happy face here), and tried some local beers. 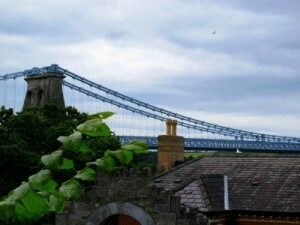 After a while, I learned to discern the Welsh accent from the British accent, and I was able to recognize the Welsh mountains from the top of the Cathedral in Liverpool when I went back to union-jack-land on a daytrip one weekend. I got used to seeing a dragon everywhere I went, for it was the symbol of Wales. I enjoyed the University, its classrooms, its iconic Arts Building proudly perched atop the hill and overlooking the lower part of the town. 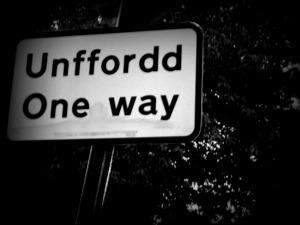 I got to know a bit about the Welsh language, about Welsh national pride and about how beautiful the country really is. Much like this blog post, the UK trip (and possibly my entire life) has been a balanced alternation of work and travel – brain and heart. I love that my work gives me the opportunity to keep moving, to keep learning, and to keep venturing out of my comfort zone – sometimes just by a little, and other times by a lot. I love being able to meet new people, be transplanted into a new culture and have to decipher a new language, even if it’s just for a little while. I love taking tons of pictures and bottling up all these memories of how things looked, smelled, sounded and felt. I love the area of research I have fallen into over the years, as frustrating and futile as things feel sometimes. It’s hard to imagine finishing my PhD, and being the one to give lectures and keynotes at a Summer School one day. It’s hard to imagine having the answers to give to students who will ask me for a meeting, in the future. But I guess, if you had asked me five years ago, if I could imagine where I’d be today, I’d probably have said “no” as well.